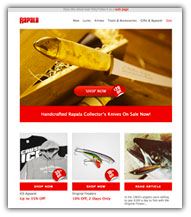 Welcome to the Respected Rapala Brands Dealer Locator. Enter your zip code below to search for dealers in your area who carry any combination of Rapala, VMC, Storm, Trigger X, Sufix, Blue Fox, Luhr-Jensen, Terminator, Williamson, Marcum, or StrikeMaster products. We found dealers in your area. View the results below.